Franz Stuck (February 23, 1863 – August 30, 1928) was a German painter, sculptor, engraver, and architect. 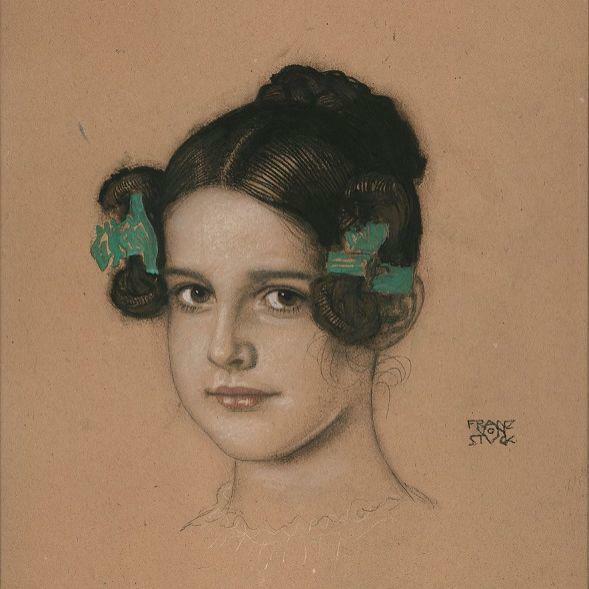 In 1906, Stuck was awarded the Order of Merit of the Bavarian Crown and was henceforth known as Franz Ritter von Stuck. Born at Tettenweis near Passau, Stuck displayed an affinity for drawing and caricature from an early age. To begin his artistic education he relocated in 1878 to Munich, where he would settle for life. From 1881 to 1885 Stuck attended the Munich Academy. He first became well known by cartoons for Fliegende Blätter, and vignette designs for programmes and book decoration. In 1889 he exhibited his first paintings at the Munich Glass Palace, winning a gold medal for The Guardian of Paradise. In 1892 Stuck co-founded the Munich Secession, and also executed his first sculpture, Athlete. The next year he won further acclaim with the critical and public success of what is now his most famous work, the painting The Sin. Also during 1893, Stuck was awarded a gold medal for painting at the World's Columbian Exposition in Chicago, and was appointed to a royal professorship. In 1895 he began teaching painting at the Munich Academy. In 1897 Stuck married an American widow, Mary Lindpainter, and began work designing his own residence and studio, the Villa Stuck. His designs for the villa included everything from layout to interior decorations; for his furniture Stuck received another gold medal at the 1900 Paris World Exposition. Having attained much fame by this time, Stuck was ennobled on December 9, 1905 and would receive further public honours from around Europe during the remainder of his life. He continued to be well respected among young artists as professor at the Munich Academy, even after his artistic styles became unfashionable. Notable students of his over the years include Paul Klee, Hans Purrmann, Wassily Kandinsky, Alf Bayrle and Josef Albers. He was a member of the International Society of Sculptors, Painters and Gravers. Franz von Stuck died on August 30, 1928 in Munich; his funeral address memorialized him as "the last prince of art of Munich's great days". He is buried in the Munich Waldfriedhof next to his wife Mary.